- Publisher Teenage girls are at a crossroads--no longer children but not yet adults--and the wise choices they make at this time can do much to promote a lifetime of success and happiness. A perfect companion to the Soul Deep devotional, this book puts more helpful biblical wisdom at the reader's fingertips. Two hundred carefully selected verses--categorized into fifty relevant topics--are each accompanied by a contemporary prayer, making a book that's useful as a personal prayer starter or devotional. This book will encourage teenage girls to seek God's will in every area of life. - Publisher Teenage girls are at a crossroads-no longer children but not yet adults-and the wise choices they make at this time can do much to promote a lifetime of success and happiness. A perfect companion to the Soul Deep devotional, Soul Deep-Prayers and Promises puts more helpful biblical wisdom at the reader's fingertips. Two hundred carefully selected verses-categorized into fifty relevant topics-are each accompanied by a contemporary prayer, making a book that's useful as a personal prayer starter or devotional. Soul Deep-Prayers and Promises will encourage teenage girls to seek God's will in every area of life. About "Soul Deep: Prayers and Promises"
Teenage girls are at a crossroads--no longer children but not yet adults--and the wise choices they make at this time can do much to promote a lifetime of success and happiness. A perfect companion to the Soul Deep devotional, this book puts more helpful biblical wisdom at the reader's fingertips. Two hundred carefully selected verses--categorized into fifty relevant topics--are each accompanied by a contemporary prayer, making a book that's useful as a personal prayer starter or devotional. This book will encourage teenage girls to seek God's will in every area of life. Teenage girls are at a crossroads-no longer children but not yet adults-and the wise choices they make at this time can do much to promote a lifetime of success and happiness. A perfect companion to the Soul Deep devotional, Soul Deep-Prayers and Promises puts more helpful biblical wisdom at the reader's fingertips. Two hundred carefully selected verses-categorized into fifty relevant topics-are each accompanied by a contemporary prayer, making a book that's useful as a personal prayer starter or devotional. 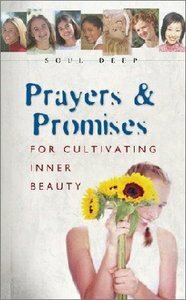 Soul Deep-Prayers and Promises will encourage teenage girls to seek God's will in every area of life.